Beech is not as common a wood in North America, predominately a north eastern species, but huge volumes are showing up as Russian imports. 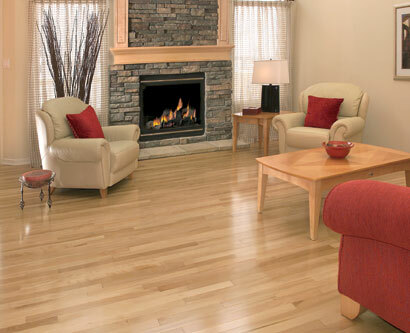 It is a beautiful wood with colours similar to a birch but with a bit more grain pattern and greater durability. It often shows some nice curly figure. It has one major flaw though, as you'll note when you read about it's lack of dimensional stability. Dimensional Stability: Below average, thus Beech hardwood flooring is not recommended for northern installations where there are high swings in moisture and temperature conditions. Exceptions can be made in new home construction where air exchangers and air conditioners regulate the environment. For older, leaky houses it may be best to avoid this species. Durability:Strong, excellent shock resistance, harder than oak but not as dense as Hard Maple. Beech is typically a light straw colour with dark reddish brown heartwood. It has a fine texture with a tiny fleck in the wood that makes it easy to identify. Often you can find boards with a curl in the grain that really adds to the beauty of the wood. Again in flooring make sure you have a conversation about colour consistency to assure that the product is in line with your decorating needs.. it can have a high degree of colour variation from heart wood to sap wood. Colour change: limited colour change on exposure to strong lighting. Flooring manufactures may include a UV protectant in their finish just as a matter of course. Indentation:beech does resist many of the dents and scratches due to its hardness. It is kind of in the middle between oak & maple in terms of grain pattern, thus scratches will show, but not to the extent of on a maple floor. NOTE: we can only sell Mirage flooring into the Sudbury District as a condition of our distribution agreement.